Deck Resurface products are basically similar to extremely thick paint. They are designed to mask the wood and fill large cracks or voids. 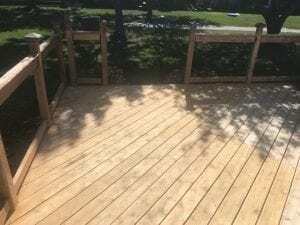 Deck Resurface products will not show any wood grain. Please note that this product is far beyond conventional wood restoration. Pros: Excellent UV protection. Enhanced traction. Fills voids and cracks. Great idea to restore an older deck if it actually works. A Semi-Solid Deck Stain will only show a small amount of wood grain as they contain a high amount of pigment. They are offered by a limited amount of manufacturers. Semi-solids can be both water-based and oil-based. Semi-transparent stains contain pigments that highlights the natural grain while sealing the surface. The semi-transparent wood and decking stains are our favorite. Both water and oil-based are available. Pros: Average to better than average UV protection. Shows natural grain. Very good penetration. In most scenarios can be cleaned and re-coated easily. Can be removed with a deck stain stripper. Cons: Most water-based versions perform poorly compared to the oils. Many states with the Low VOC laws have a limited amount of quality oil-based stains available. May need to buy online if in a Low VOC area. Transparent deck coatings look the most natural as they contain minimal pigment. 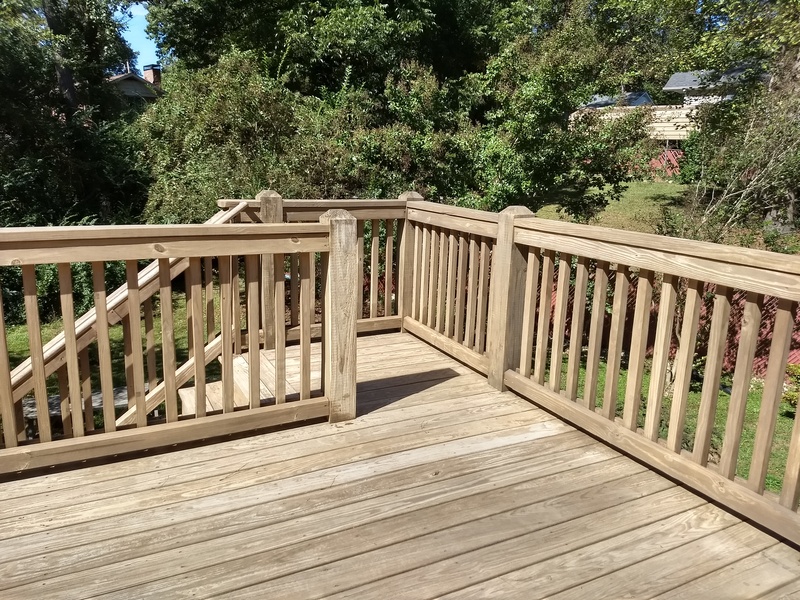 The average life of a transparent decking stain is about 1 year. Mostly oil-based only are available. Drying oils are “curing” oils. This means that they actually dry on top of or just below the surface. They will help “seal” the wood as well. Non-drying oils are the opposite. They never actually dry, but rather dive deep into the wood to help condition the cells of the wood. Paraffin oil (not wax) is the most common. 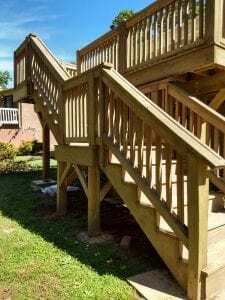 Are Deck Finishes, Stains, Sealers, or Both? This question can be confusing to homeowners. In general, all deck stains are sealers as well as they will help prevent water absorption. Deck sealers typically are not stains as they do not have any pigment. Some though may have a very light tint. Currently, there are 17 States that restrict Decking Stains and Coatings. These states require a lower amount of Volatile Organic Compounds to be released into the air. This mainly affects oil-based coatings. By lowering the amount of “solvents” that can evaporate into the ozone you need to increase the amount of “solids”. This can cause issues with oil-based stains as they may have drying and curing problems. There are still a few good oil-based stains allowed in the Low VOC States, but not as readily available at your local stores. You may need to go on the Internet to find them and have them shipped. A couple of examples would be TWP 1500 Series and Armstrong Clark Wood Stains. With all of these different types of products, we prefer the semi-transparent products as they allow the wood grain to show. They offer better than average UV protection and can be easier to reapply in the future. Penetration is better for oil-based versions over the water-based versions. The one exception is the water-based Defy Stains. *All decking stains will eventually fail that is why you want a deck stain that is easy to work with down the road. Can the these stains be used on a children’s wood playground set? So, exactly what brand and type is TheBEST OIL-BASED product??? I want an old fashioned oil product that deeply penetrates the wood and cleans up with Mineral Spirits or Turpentine. TWP Stains or Armstrong Clark wood stains. I have a nine year old deck made out of Southern Yellow Pine L-3 pressure treated wood (Wolmanized). It currently has a Penofin stain on it. If I have the deck power washed and brightened, can I use the TWP stain on it? 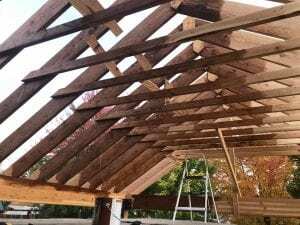 Will TWP adhere and last for the 2-3 year expectancy on pressure treated wood? I live in sunny Colorado. Did you remove all of the Penofin? It will need to come off for the TWP to perform properly. Yes, all of the penofin will be removed. I guess I’m wondering if TWP would be the best stain to use on pressure treated wood. Have there been any issue with TWP and pressure treated wood? Some stains (Messmer’s) are made for pressure treated wood. Do you recommend them over TWP? TWP works great for PTP. 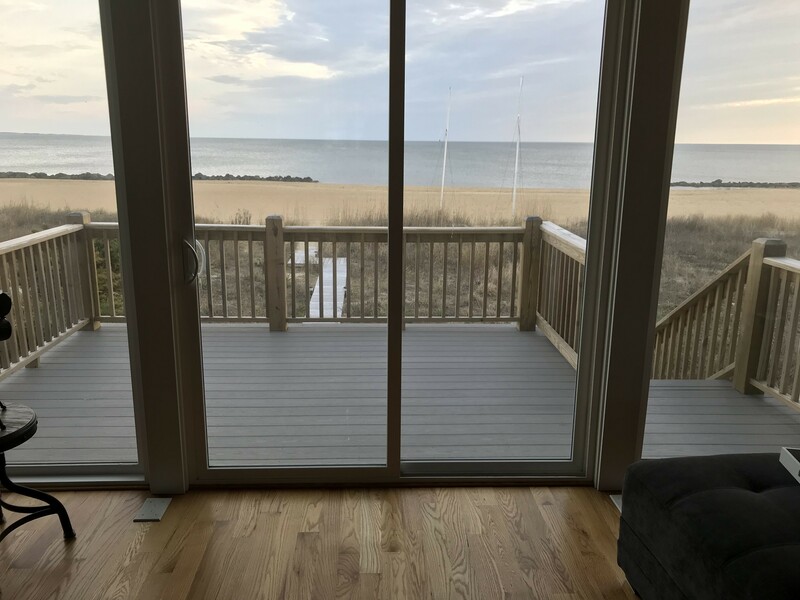 Northern facing deck on the beach built one year ago in SE Virginia. Deck boards are composite. Wanting to stain the pine railings white. Solid vs semi? And what is the best choice of brands for coastal salt/weather? If you want white you will need a solid stain. Try Flood Pro Series solid stains. What is best manuf for Flood Pro Seies white stain? Located on the Jersey shore. Can you recommend a good product to use on a mahogany porch? We live on the water in Annapolis Maryland and are surrounded by lot’s of trees so the deck gets a lot of wear and tear from Mother Nature. From the reviews I read, it sounds like a semi-transparent oil based stain is our best bet. However, I was hoping for a grayish brown color and the highly recommended stains don’t seem to have the color. I want to stay away from an orangish shade. Any suggestions? None have a grayish brown color. You can get a gray or a brown color. Look at Armstrong Clark. Hi, we have a 14-year old deck, apparently made of pine. We live in West Michigan, and the deck get lots of direct afternoon sun in the summer , and cold with snow/ice in the winter. Also some woodpecker damage. Appreciate any suggestions, thanks! Prep is key. Make sure to clean and or strip. Brighten the wood after. Stain with TWP 100 Series or Armstrong Clark. I have a brand new mahogany dock. It sits in full sun. I wanted to just put a clear oil on it, and reapply yearly, but seems that clears provide no UV protection. Suggestions? It is not possible for a clear to provide UV protection. Pick a tinted color. Look at Restore-A-Deck Stain in Natural or Armstrong Clark in Amber. Thank you! It was installed in late December/ early January. Can it be stained now as it’s color is already being effected by the sun? 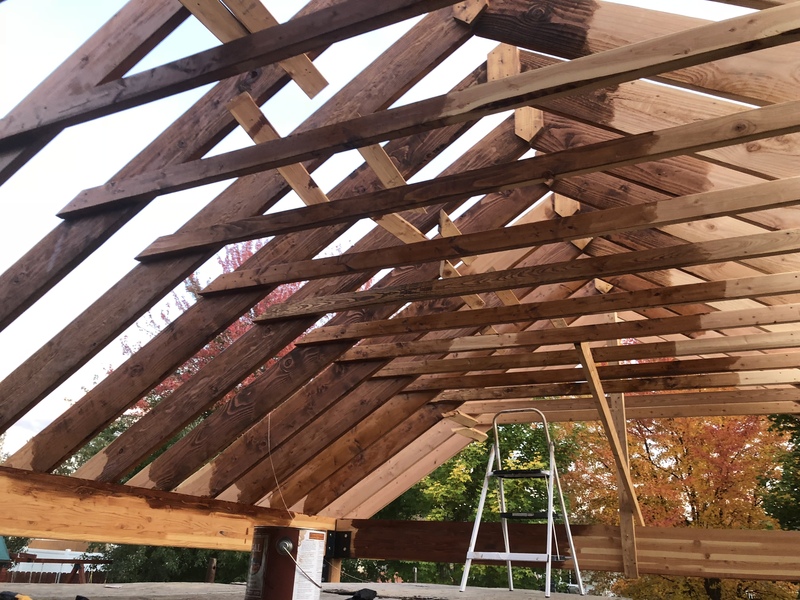 Since it is new, does it still need to washed prior to staining? Not a mark on it. Thanks again for your help! Yes, it has to be prepped. Just one coat. This deck is actually a dock…so above water. Is there an ecological cleaner and brightened that will be effective? We don’t want to put chemicals in the lake. Suggestions? Thank you! Restore A Deck Cleaner/Brightener Kits are Eco-friendly. 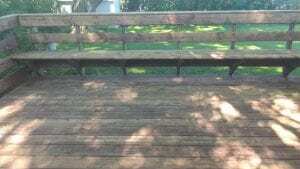 I have a 8 year old Redwood colored composite deck (ChoiceDek from Lowes) that is very faded and worn. I have over the years cleaned the deck and used Encore Rejuv and Renew, bu they no longer bring back the color. Is there any product I can use? Manufacturer says Oil based solid stain, but don’t know what product. Sherwin Williams says DeckPaint will work on older worn composite decks, but local dealer says it won’t stick. Help!! Sorry, but no idea as to if anything will stick to it. 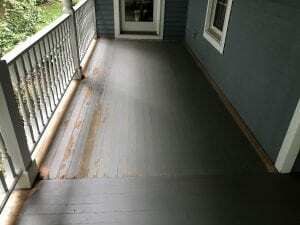 As contractors, we do not coat composite decks since we are concerned about it failing. Just had a deck hand rail coated with a Sherwin Williams semi-transparent redwood stain (probably water base). It was done about one week ago on fairly hot afternoon in direct sun and is blotchy and sticky in places. The contractor told me it will just take a while to soak in but I don’t believe that. I think he’s trying to fleece me and get the final payment for a large renovation contract/project leaving some problems for me to deal with. So, what is “Flash Drying”? How would you recommend solving the problem (Probably removing the last coat of stain)? You will need to remove and start over to fix. It will not fix itself. Try to find TWP or Defy Extreme. 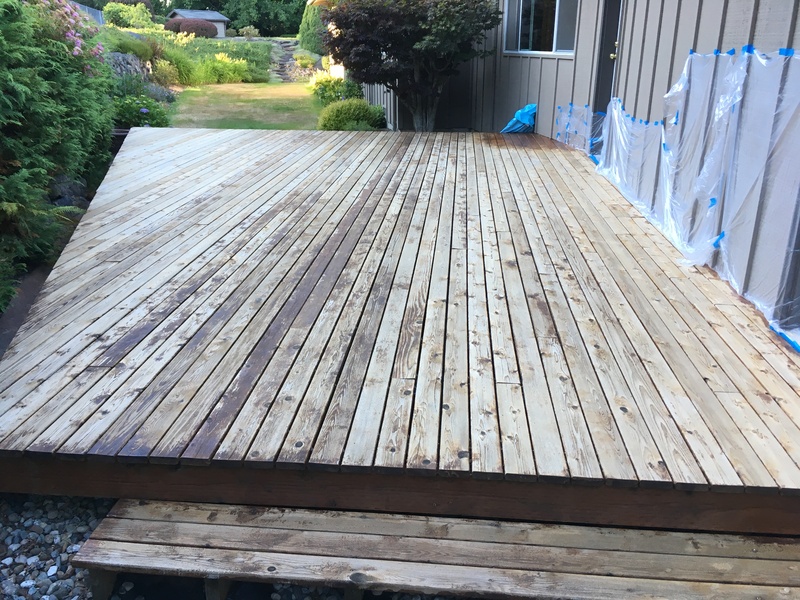 What is best way to re stain my pressure treated pine deck.. built 2yrs ago- finished with Olympic Woodland Oil Stain (Desert Sand Semi Transparent- a light brown color. 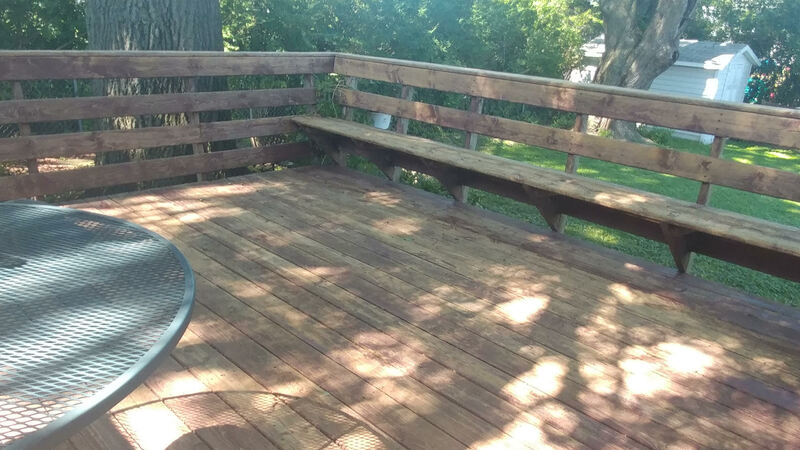 I have cleaned surface… still has a lot of spotty surface stain.. not so much on deck boards but lots on railing and vertical surfaces. I would like to use TWP 1500 on the deck boards. Would be very difficult to impossible to sand all the railings/rim joist, etc…. Please advise best way to proceed. The attached pictures in bright sun make the lumber look better than it really does. I live in Atlanta GA area; deck is on west side so gets brutal afternoon summer sun. You need to strip and brighten for the prep. Use the Restore A Deck Stripper/Brightener Kits. If I use the same Olympic Woodland Oil on railings and all vertical surfaces, can I get away with not having to use stripper on those surfaces only? If not, then can I just cover with a solid water based stain product?…. I can strip the floor boards easily enough and I think TWP 100 is sold here too, rather than the 1500. No, you cannot cover it will a different brand or type of stain. Stripping should be done. It is not hard to do. Is it correct that a penetrating stain can be reapplied directly when faded, and does not require stripping down to the bare wood? As I understand, penetrating means oil-based. I live in Massachusetts, so will that be hard to find? You can still use oil-based in MA. TWP 1500 and Armstrong Clark are both compliant there. Getting ready to stain my cedar deck for the first time. It has sat for a year. I live in Maine, about an hour north of Portland. Need to do a little sanding to get rid of the dog claw marks. Planning on pressure treating then using a wood brightener. I would like a stain that brings out the natural color of the cedar. Suggestions? Use a deck cleaner while pressure washing. TWP 1500 or Armstrong Clark wood stains. Has anybody used Sikkens ProLuxe Oil Base Stain Cetrol DEK Finish? I have a deck guy wanting to use it on an old deck. The DEK is not designed for decks. Peels. I’m in the process of stripping the old peeling paint off the deck from the old owners. During this time I stopped for a month and you can clearly see a difference between recently sanded wood and wood sanded a month ago. I was originally going to use a tintable stain, but after reading your website I’ll be going with an oil based for the fact I never want to do this again. Having said that, will there be a noticeable difference in look since some wood looks more faded? Clean and brighten this wood for final prep and it will even out and the stain will soak in better. We started staining our wood rafters on our new deck yesterday with Ready Seal and it rained unexpectedly for a short time this morning. We got about half of the boards done and now don’t know what to do. Should we wait to do the rest till they dry, continue while wet? How will this affect the look of the stained boards? Freaking out over here. The pic is what we got done yesterday. You will need to let the wood dry for a couple of days before finishing the staining. It should be okay. Hello. About 3 to 4 years ago, I stained my back deck with Cabot’s Australian Timber Oil semi-solid stain. I was never really happy with the look of it where some areas seemed to take better than others and some places had shiny spots as another person reported. Plus, now, it needs to be redone so I used a cleaner and brightener and have power washed it. I got quite a bit of the stain off but not enough to go with semi-transparent. I have read on here in several places that if you use the exact same product, you don’t need to strip it completely off but as I was not really happy with the product covering evenly the first time through, I am not sure which way to go here. Can I use the same product, different color? Mine was Cabot’s Australian Timber Oil semi-solid stain mission brown which had way too much red in it in my opinion. If I used same brand, could I go darker color or more brown color or does the color and brand and type all have to be exact to avoid stripping? I am not sure I want to go total solid stain as it sounds like it peels pretty quickly. I’m not even sure I want to go with Cabot again as the coverage was not that great in the first place. Any other options here? Thanks! Hello again. Here are the pics you asked for. The first two are of the back deck where we used the Cabot’s Australian Timber Oil semi-solid stain. So, I need to know what is best to use on that now? The 3rd pic is of the front porch which has been sanded and cleaned with wood cleaner and brightener and never had the Cabot’s so if I can use something different for the front, I’d like that? Thank You! Best to remove all. Use a stain stripper and pressure washing. Brighten the wood after. Once removed, you can use any color or brand that you like. Thanks! I was afraid you’d say that. I am putting my house up for sale. The wood is rougher than you can see. The back deck wood is probably 25 years old plus. 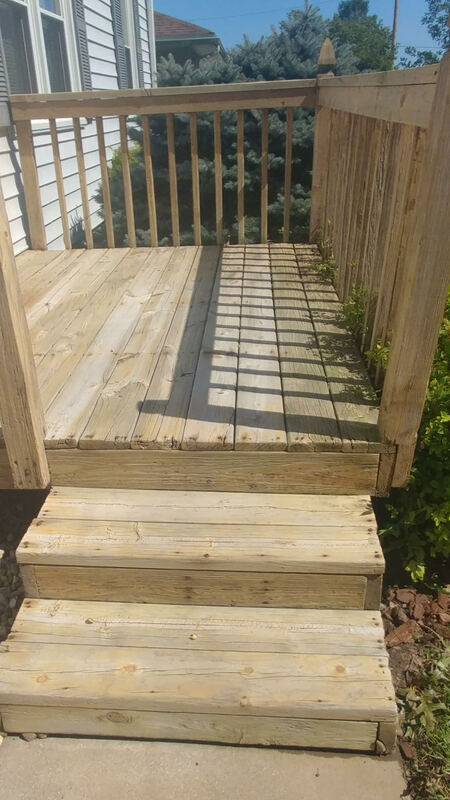 Would it really be that bad to use semi-transparent on the front because that deck is completely free of stain and then on the old back deck, use a solid stain maybe? I just want it to look good when I put the sign up. Any nice oil solid stains that look less like paint? Thank you. Solid stains all look like paint. You can do this if you are just trying the sell the house but you will be leaving the next owner with a deck stain that will probably peel. It is most likely gone for your area. You may have to strip and switch to a different brand. These are still BVOC compliant oil-based semi-transparent stains. Armstrong Clark and TWP 1500 Series. Where in Boston Massachusetts can I purchase the TWP & Armstrong stains what stores sell them. Best to contact the manufacturers for help locating. 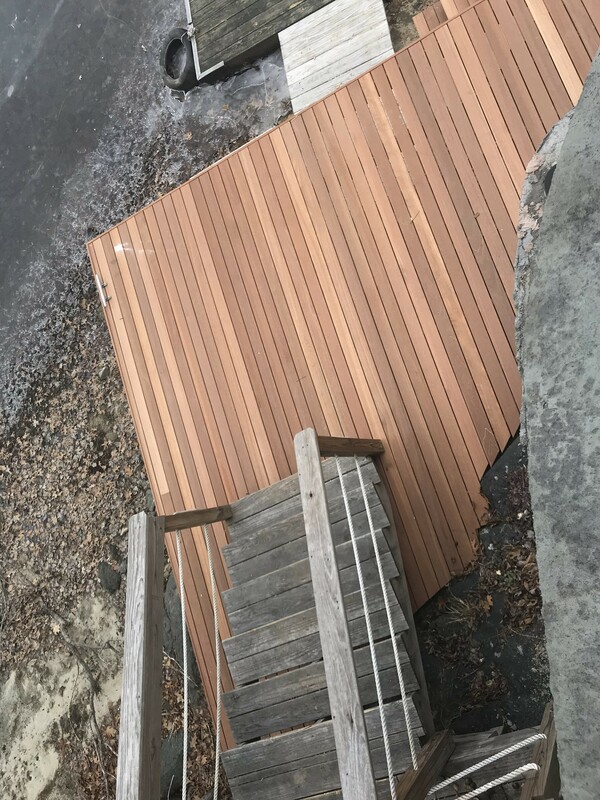 I purchased a house with a 25 year old deck. I believe they used a deck restoration product on it, but as you can see it is peeling badly. There are multiple coats of different products from over the years. Also some boards will need to be replaced as they are in bad shape. What method do you recommend for removal, it is appearing to scrape off easily, don’t know if I should also power wash and sand? What type of product do you recommend and is fall a good time to do it? Northern Ohio area. Let the new boards weather for a few months. Prep to remove all old coating and then brighten the deck. Stain with Armstrong Clark in a semi-solid color. I just installed a new fence and want to stain and preserve it. 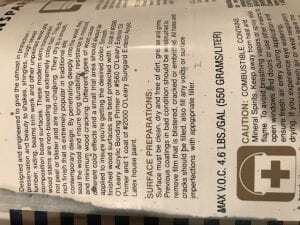 How does Preserva Wood rate in comparison to TWP 1500? TWP is a much better product in terms of UV protection. 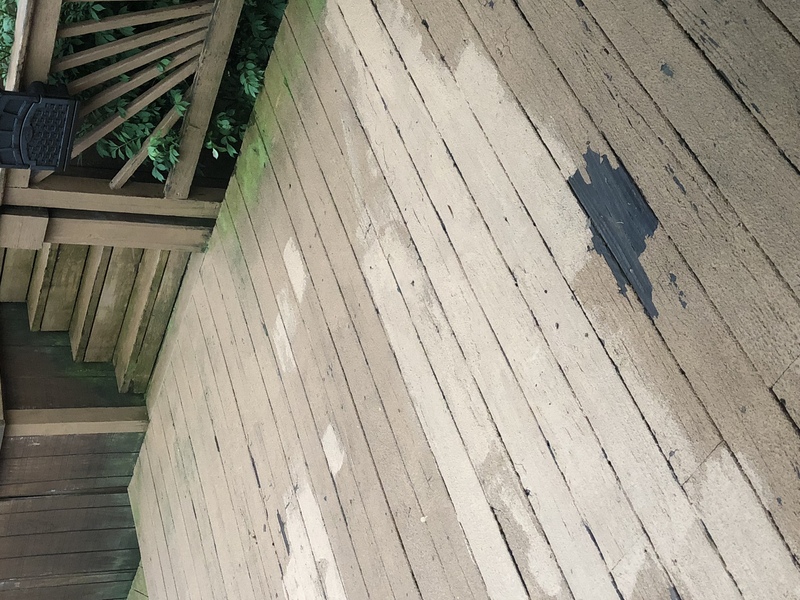 A deck stain will not protect against rot in this scenario where dirt and water is constantly present. Sorry. 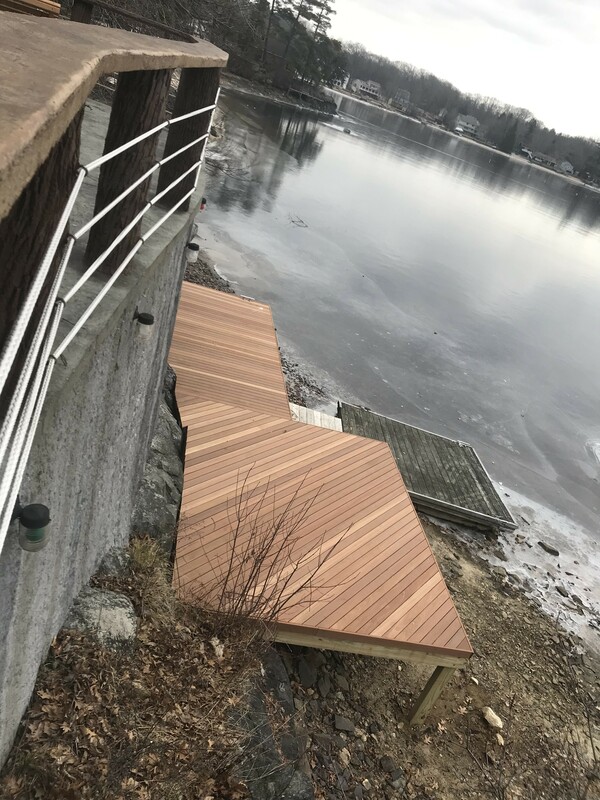 We just installed a new pressure treated deck. Looking for a low VOC stain/sealant. Also, how long do you wait to apply the stain to the new wood? 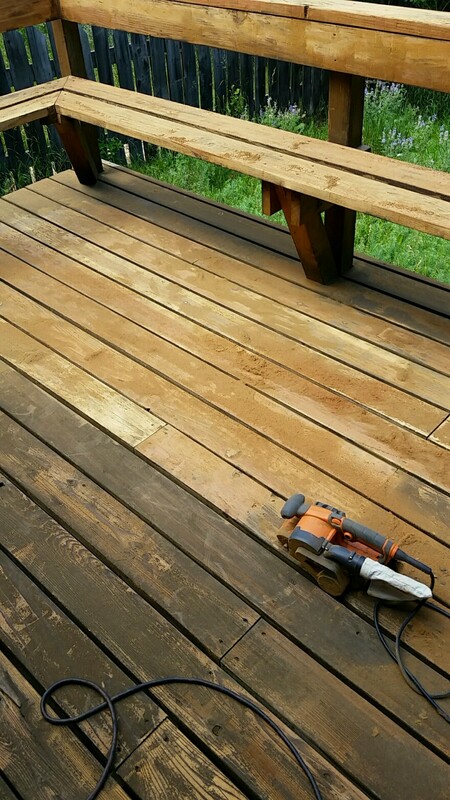 After the wait and prep, try the Defy Extreme or Restore-A-Deck Wood stains. Would Armstrong stain be better purchased at Sherwin Williams vs Lowe’s or Home Depot? You will not find AC in those places. Call them for assistance with locating. Is there a deck stain that doesn’t retain so much heat during our extremely hot summers in Texas. I can’t walk bare footed on mine. I want to use the semi-transparent oil based but would go another way if there is one that won’t absorb so much heat? Is there such a thing? Not really based on a deck stain brand or type but in general, lighter colors will retain less heat over a darker color. What is your opinion of Floods & Thompsons Semi Transparent oil Vs Cadots Semi Transparent. Cost is the issue for me. Quality vs price . Is this Australian oil soo much better. Of those three, we would use the Flood as long as it is the oil-based version. 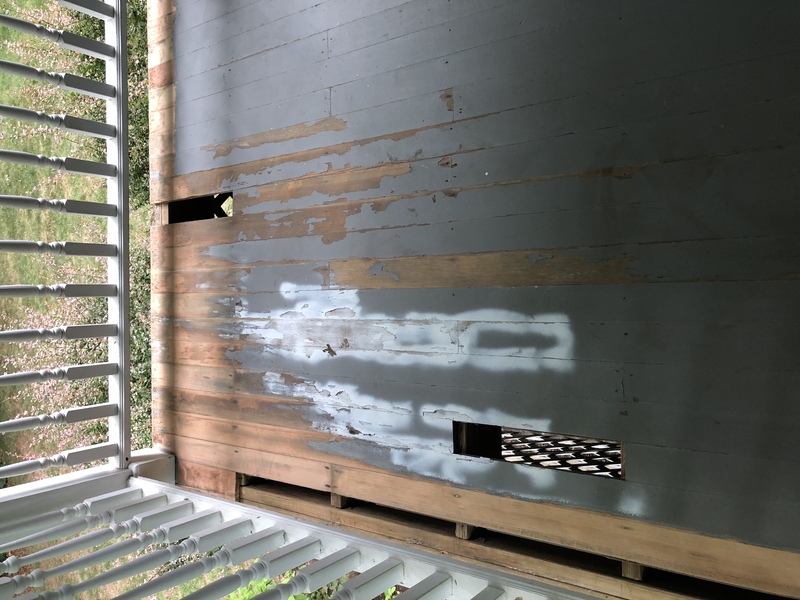 I’m redoing deck that has semitransparent but didnot get all of old stain off .can I apply the same semitransparent stain on deck? Will it cover where old stain is still there? If the same brand and color, you should be okay. Great site, lots of good info -your site is so valuable to all the DIYers out there, keep up the great work! 1. I have two large covered PT decks. Used a regional supplier’s semi-transparent oil based penetrating stain for years – no problems – EVER!. Every 6-7 years we cleaned and stained (2 coats). Stairs/unprotected areas were prepped and re-coated every 2-3. After 20+ years of this, protected areas almost looked like solid stain due to several coats. When I went to get more stain, was told VOC laws changed and my orig stain wasn’t available. They switched me to BM Arborcoat semi-trans classic oil finish (#C328). I was told to prep/apply same as before and OK to put right over the old stain. New stain was very tacky even after several weeks, started flaking the next year – everywhere, even unprotected areas that were nearly down to bare wood when stained. Reading BM label, it says only apply 1 coat. We have power washed & scrubbed multiple times until flakes appear to be fully removed, but when BM was reapplied it is still flaking, even on unprotected areas. Not sure if issue is the original extra coat, putting over another brand of stain, or the new product itself (I see BM isn’t getting great reviews). Decks are 1000+ sq ft, so big job to strip and many layers. Is solid stain an option? Would I need to strip regardless of what I use due to flaking/build up? Any suggestions? 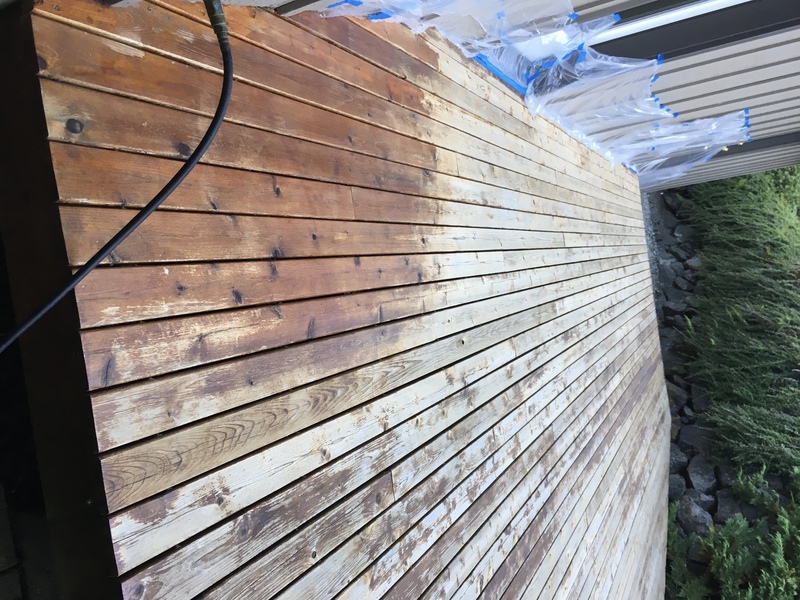 I would not be opposed to the solid stain look, since that is pretty much what I have now on most of the deck due to all the layers of semi-trans, but if I have to strip I would probably stay with semi-trans oil. 2. I also have a newer PT deck I will be staining (lots of sun, not covered, in MI). I have (4) gallons of the BM Arborcoat, should I use that for either the new deck or for the properly prepped large deck – or should I just bite the bullet and purchase a different stain (tintable to match what I have) and get a better product? Would you suggest the same product for both decks, even though one is not protected? 3. Also have a PT deck off the basement walkout that is about 4″ above ground, I believe there are issues with the types of stain to use when closer to ground- suggestions on that too? Photo of flaking and label for old stain. Unfortunately, there is not a stain you can apply over all of this to fix this. You will need to sand it all down to the barre wood and start over. Adding anything on top will result in more peeling. So I chose red wood stain for my deck semi transparent . I put it down on the floor panels but I don’t really like he shade. I think it might look better with more red in it. Can I use another stain with red in it as a second coat to hep tone down the orange color? You cannot use another stain brand on top. You will need to remove the first coat. I have stripped my 25 year old porch floor down to bare Douglas fir tongue and groove boards. Not pressure treated. New England region, so it gets weathered. UV protection doesn’t matter as it’s covered and north facing. Previously had latex exterior paint which peeled every year. I want low maintenance. 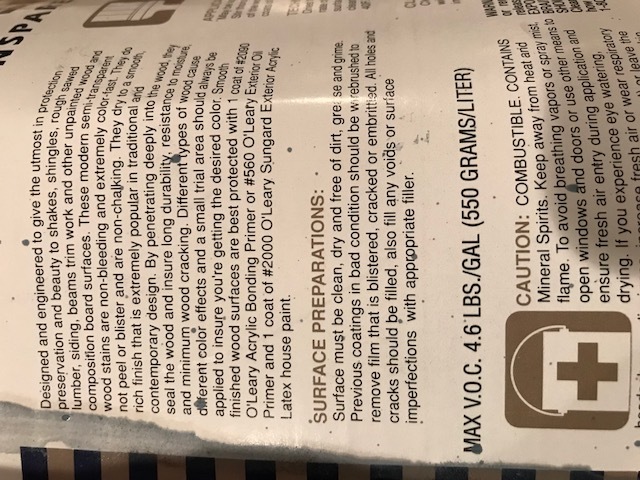 I was considering Behr Premium Solid stain because I like the look of a solid stain, however I worry that it too may peel. Any suggestions on how to protect it? I attached a picture mid-project. Use the Flood Pro Series Solid Stains. This particular Cabot will not provide any UV protection from graying. Useless in our opinion. I have some staining to do around the house and I’m tired of poor quality stains. Can someone suggest some brands? I live in the mountains of southern ca. Temps range from 15-100 degrees. I want to restain some cedar shingles that get a lot of sun in the summer. I’ve been using super deck but it last maybe 2 years. I also have an alder front door that needs stain touch up. Strip off the Super Deck and use Armstrong Clark or the TWP 100 Series. The richer the color of the stain, the longer it will provide UV protection in full sun. The stain on my redwood deck had darkened over time. I tried power washing it and eventually ended up sanding it to get it back to its original look. What would be the best next step for me before staining it? I would like a transparent or semi transparent look to enhance the redwood. I live in northern Wyoming where we have extreme weather conditions. What suggestions do you have for further prep and which product would you recommend? Did you sanding remove all? If so, use a deck cleaner and then a wood brightener for the final prep. Stain with TWP 100 Series. I recently stained my deck with Cabots semi solid stain . Can I put CWF on it now or not ??? And if so would that give the deck a sheen look ?? No, you cannot add a shine to a deck stain by adding a coat on top. It will blister and peel. I used a semi-transparent Flood CWF-UV wood finish and it really soaked into my deck, should I put some type of water sealer like Thompson’s over the top of it? 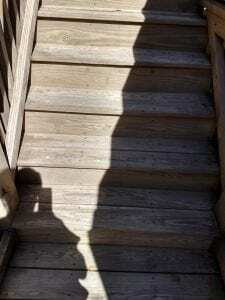 No, you cannot top coat a deck stain with a sealer. I just received a new unassembled 12 x 10 cedar pergola kit. 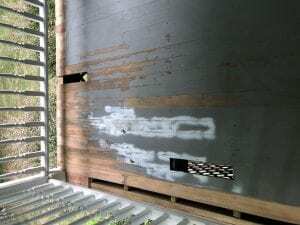 I have opened the 2 boxes and removed the lumber, which is now laid out on cardboard, or leaning against the wall inside my garage.Owners manual states a waterborne translucent stain has already been applied. How should I proceed? I would like to use TWC stain/sealer. Do I stain now before assembly? Wait 4 months, then stain? Do I need to sand each board? I’ve never done this before. Pergola will be built over a hot tub, so staining later, after assembly, will be a giant PITA. 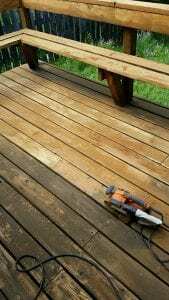 I have a guy that will be staining my deck. He is offering Pittsburgh Ultra Advanced & Weather screen (solid) and Behr Premium (solid). I live in Minnesota and was wondering which would be the better product. How good is C2 Guard? Never used it. Only a few consumers have mentioned it here on this site. 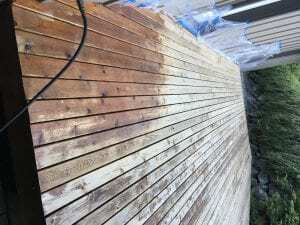 How does the new Restore A Deck stain compare to the Defy water based stains? Very well. We like them both. Thank you for your response. As I said above, I used JoMax stripper which is not getting all of the Sikkens off. I found DEFY Stripper locally and was thinking about using it to get off the rest of the Sikkens. However, the sales guy said that 1). I should not mix two brands of strippers and 2). I should not use the DEFY Brightener with the JoMax Stripper, again mixing brands is bad news. He suggested that I wash my deck again (I have rinsed the JoMax off thoroughly), let it dry a couple of days and then use the DEFY stripper and brightener.) Can I mix the two brands of strippers safely and do I need to again rinse/wash my deck before using the DEFT Stripper? You can use both on the same deck and brighten all when done. No need to rinse again. Hi, so glad to have found your site!! My decks are over 30 years old and to my knowledge my painters had only used CWF-UV. In protected areas the finish stays beautifully glossy. In sunny areas the finish tends to not stay glossy for longer than a few years. The last time the decks were stained was 7 years ago. After power washing there are now areas that still have the darker splotches. 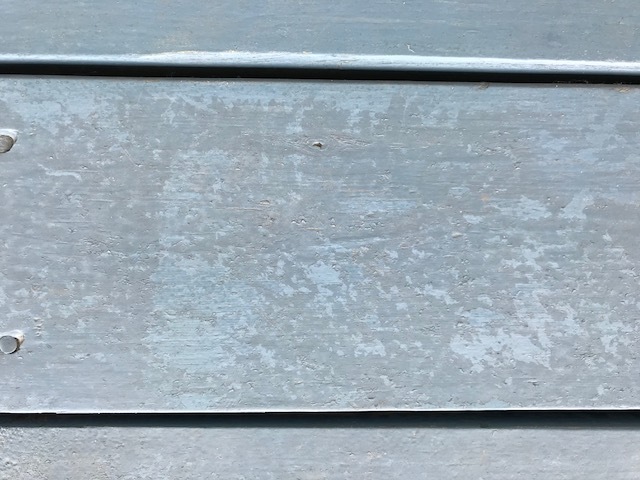 Unfortunately, the painters I have today don’t have a clue on how to match the weathered areas( and don’t want to do it properly by stripping the wood). I finally found the Flood semi-transparent acrylic/oil pro series that can be tinted to the color I want (walnut) but it doesn’t seem to have the gloss. So I am going to make the painter put one coat of that (walnut) followed by CWF-UV semi-transparent cedar which has the gloss I’m used to….what trouble am I setting myself up for? A lot. It will never match. Best to remove all and start over. I was hoping since they are both Flood products that it will be ok to use in that manner. So what I really was hoping that you could tell me was what will happen…. will it never dry, will the top coat peal off, etc….. It will peel and not blend. We bought a house and the previous owner used restore color being autumn brown. Here’s the problem …. our back yard is in full sun all day . Our deck as is very hot to walk on. We have a pool in backyard and a dog. We have extended one side of our deck out and installed a hot tub. 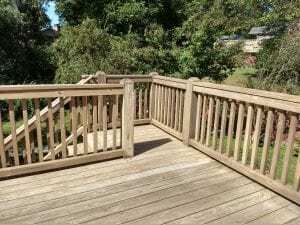 We would like to change the color of the existing deck to accommodate the heat problem. What product can we use to paint over what we have that is heat resistant and durable ? You cannot paint over this product. You will have to sand it off to fix it. Strip and sand to remove the Cuprinol. Brightener after. Stain with TWP Stains or Armstrong Clark. I just stained two small handrails with Cabot’s semi-transparent stain. Was wondering if I can now apply a product such as poyurethane, etc., to give it an even smoother feel? 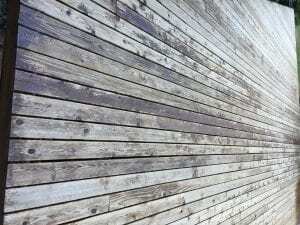 You cannot apply a sealer or coating like a poly over a deck stain. Thank you for your answer, and for the wonderful service you provide to so many! My deck at a lake home in central Missouri needs staining. It is treated wood, probably at least 20 -30 years old. A couple of times it was stained with Cedar tone CWF-UV. Then a couple of coats of a Pittsburg solid. Needless to say, it chips and peels and had to be redone. It is in the process of being completely stripped of all stains down to bare wood. What type of cleaner would you then suggest? After that, I want to use an oil based semi-transparent so that I can see the grain. I read your comments about TWP-100 and 1500. What is the difference and what should I use? As I read the comments, it looks like the oil based semi’s need to be redone every 2-3 years. Do they then need stripping again or just another coat or two of the same oil based stain? After the stripping and sanding to remove the current stain, use both a deck cleaner and a wood brightener for the final prep. Use the TWP 100 Series for this. When you redo in the future, just clean and brighten the wood for prep. No need to sand or strip. We used solid Olympic stain for the first time this year, in cedar color and it says it will last up to 6 years. Before that we used semi-transparent stain (for about 8 years) but had to redo every summer, a lot of work,(we get the sun all day). 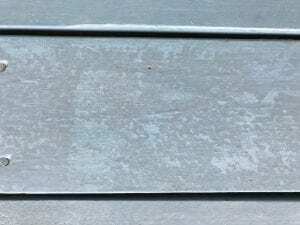 If this solid stain doesn’t work , can I lightly sand this stain than paint with outside paint for wood. Tired of all the work we have a 16 x 18 foot deck with 2 separated stair areas lots, and lots of spindles. Adding more products or a paint on top will not fix any issues with peeling that you may incur by using the solid stain. It will most likely make it worse. After the weathering, clean and brighten the new wood. Strip and brightener the older wood that has the older deck stain. Once prepped, try the Armstrong Clark decking stains.